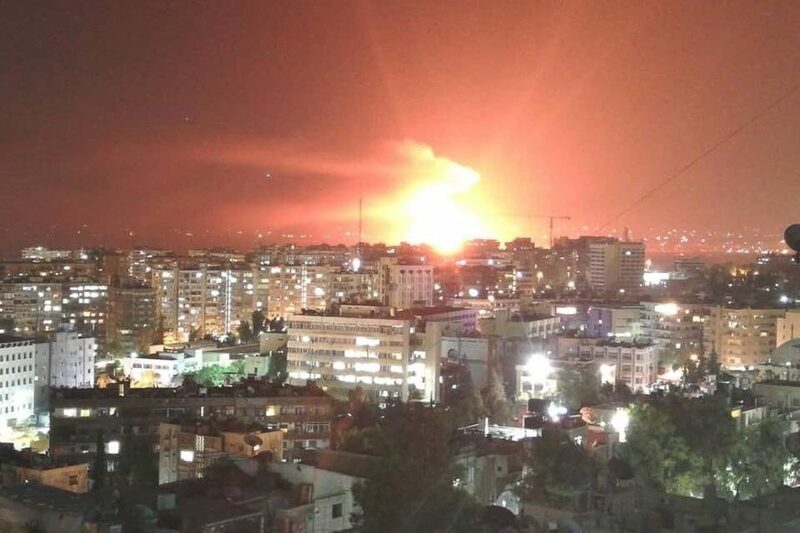 There have been large explosions at the Assad regime’s Mezzeh airbase near Syria’s capital Damascus. The blasts just after midnight on Sunday are widely attributed to Israeli strikes, with a missile setting off a munitions store. The regime is insisting that there was no attack, and that the cause of the explosions was an “electrical short circuit”. Syria denied an attack had taken place. Syrian Army source at Mezzeh Airport says it was a missile strike. Israel has regularly struck positions of the Assad regime and its allies during the 7 1/2-year conflict. Initial attacks focused on stopping Iranian weapons and missile transfers to Lebanon’s Hezbollah, a key ally of the regime, and on preventing an Iranian and Hezbollah presence in southwest Syria near the Israeli-occupied Golan Heights. However, in the past year the attacks have expanded across Syria, seeking to restrict the regime’s missile and chemical weapons capability. They are also supporting the demand of Israeli Prime Minister Benjamin Netanyahu for withdrawal of Iranian personnel and Iranian-led foreign militia from Syria. On Wednesday, Netanyahu vowed that Israel will continue taking action against Iran and its allies, and will not be deterred by a defense cooperation agreement signed between the Assad regime and the Islamic Republic last month. View over #Damascus #Mazzeh Airbase shows secondary blasts following initial suspected airstrike.